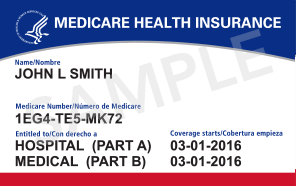 The Centers for Medicare & Medicaid Services (CMS) recently completed a large-scale effort to provide new Medicare cards without Social Security numbers to people with Medicare. The new cards support the agency’s work to protect personal identity and reduce fraud and abuse. Over the past nine months, CMS sent new cards to more than 61 million people with Medicare across all U.S. states and territories, completing the mailing ahead of schedule. • Call 1-800-MEDICARE for assistance. They will verify identity, check the address on record, and help get a new card. • Medicare beneficiaries can log into their MyMedicare.gov account to get their new Medicare number or print their official card. The new Medicare number is now available in their account, even if they didn’t receive their card in the mail. Accounts are password-protected and secure. To access or create an account, visit MyMedicare.gov. • Ask the healthcare provider. Providers may be able to look up a client’s Medicare number through a secure portal when they come in for healthcare services. • Destroy your old Medicare card so no one can get your personal information. • Start using your new Medicare card right away. Carry it when you need healthcare. Medicare coverage and benefits are the same. The new card does not impact or change your healthcare benefits. • Keep your other plan cards. If you’re in a Medicare Advantage Plan (like an HMO or PPO) or a Medicare Drug Plan, keep using that plan ID card whenever you need care or prescriptions. However, please carry and protect your new Medicare card too — you may be asked to show it. • Protect your Medicare number just like a credit card. Only give the new Medicare number to doctors, pharmacists, other healthcare providers, insurers, or people you trust to work with Medicare on your behalf. Medicare will never call uninvited for your Medicare number or other personal information.